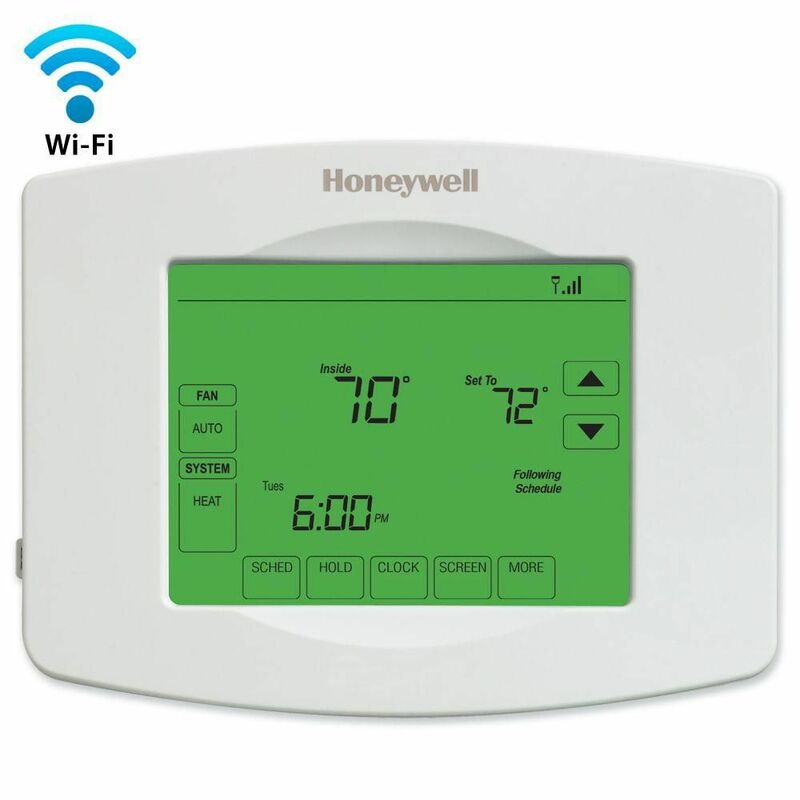 For a reasonably priced thermostat that comes with all the modern features you could ever want, you need the Honeywell Wi-Fi Programmable Touchscreen Thermostat. If the Wi-Fi connectivity and touchscreen controls of this smart thermostat aren’t enough to convince you, just check out the thousands of positive reviews! This Honeywell thermostat connects to your Wi-Fi, allowing you to control it remotely through your smartphone or computer. It boasts precise temperature control with one-degree accuracy, and there’s a seven-day programming feature that lets you have up to four program periods per day. Further, this Wi-Fi thermostat includes intelligent alerts, letting you know if the Wi-Fi network is disabled or if there's an unusually high or low temperature in your home. It’s Energy-Star certified and boasts universal compatibility, working with almost any system type that uses a C-wire. Reviewers tout this thermostat as user-friendly, saying it is easy to install and setup. Most people agree that the ability to control the unit from your phone incredibly convenient and several say they've bought numerous units to put throughout their homes. Today's most tech-savvy thermostats can cost hundreds of dollars, but if you're fine with a basic model, you can save a lot of money. For instance, the Honeywell RTH111B1016/E1 Digital Non-Programmable Thermostat earns plenty of positive reviews from users and comes at a bargain of a price! This digital thermostat doesn't have any bells and whistles, but it does boast precise temperature control and an easy-to-read digital display. The slim, compact design will blend into your home, and the unit will maintain its temperature settings in the case of a power outage. However, note that this product does not work with a heat pump or electric baseboard systems. According to reviewers, this thermostat from Honeywell is incredibly easy to set up and does its job just fine. If you're willing to forego advanced features for the sake of simplicity, this product is a great budget option. Many people today are fascinated with smart home gadgets, which connect everyday appliances to the internet and your phone. If you're looking for a high-tech, Wi-Fi enabled thermostat, one of the top-rated options is the Nest 3rd Generation Learning Thermostat. While it's one of the more expensive thermostats out there, this product from Nest provides unparalleled performance and convenience. The sleek modern design houses an incredibly intelligent system, which learns your behaviors—such as when you’re out of the house—and automatically adjusts itself to help you save money. You can connect the Nest thermostat to Wi-Fi if you want to create schedules or change the temperature from your phone, tablet or computer, and you can even check how much energy you used in a given day and why. The Nest Thermostat works with the vast majority of heating and cooling systems, and it can also be integrated with other smart home devices. The product has thousands of 5-star reviews from customers who say it's an awesome modern device that's well worth the investment. If you know you're going to be out of the house for an extended period of time, you might want to lower your thermostat in order to save energy. However, a lot of people forget to make this change before they rush out the door, which is why programmable thermostats are such a lifesaver. Products like the Honeywell 7-Day Programmable Touchscreen Thermostat can be put on a schedule so they automatically adjust themselves—perfect for people who work during the day. This particular model has a seven-day schedule with a maximum of four time periods per day, and it can even automatically adjust itself during daylight savings time! This Honeywell thermostat features an extra-large touchscreen display, and you can either run it on batteries or hardwire it into your home. Reviewers say it's easy to install and use, and programming your schedule is a pain-free process. What more could you ask for? Not particularly handy? The prospect of installing a new thermostat might be a bit intimidating, but don't worry! 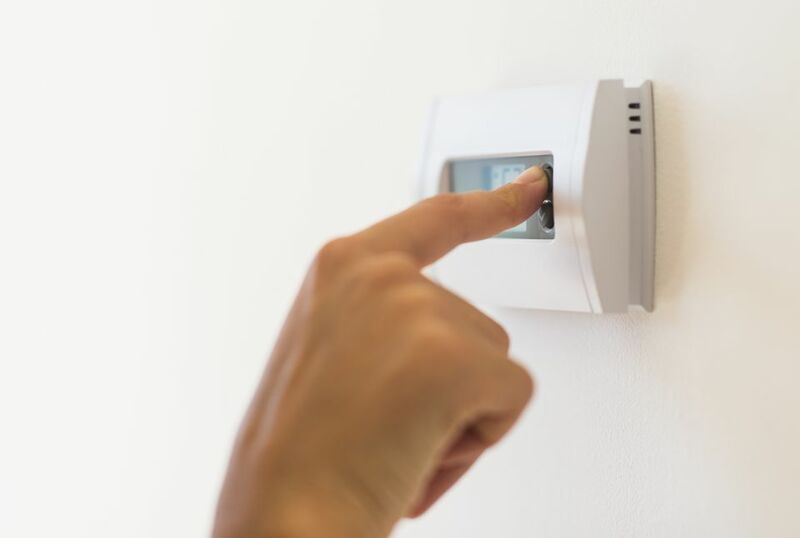 There are wireless options available, such as the Honeywell TH6320R1004 Wireless FocusPro Thermostat, that make installation a breeze. This battery-powered thermostat requires no additional wiring, and it can be converted into a “smart” device when connected to Honeywell’s RedLink platform. You can program the thermostat to certain schedules on weekdays and weekends, and it can also display the outdoor temperature and humidity. According to the manufacturer, the battery should last up to a year, and the unit can be installed in a matter of minutes. Reviewers have positive things to say about this product, writing that it's easy to program and performs as expected. However, note that you must connect it to RedLink in order to control the thermostat via your phone—without connecting to this platform, it’s just a standard thermostat. For a simple, no-frills digital thermostat, one of the most highly-rated options Honeywell TH3110D1008 Pro Non-Programmable Digital Thermostat. While this product doesn't have any of the fancy features high-end thermostats do, it will get the job done, providing basic controls, and it comes at an unbeatable price. This Honeywell thermostat features a backlit digital display that's easy to read and provides precise temperature control with one-degree accuracy. The display will tell you the current temperature, as well as what it is set to, and the thermostat has slide switches that let you toggle between heating or cooling and adjust the fan settings. This digital thermostat cannot be programmed to a set schedule, but that doesn't seem to bother reviewers. The majority agree that this is a great basic thermostat—it's easy to use, quick to install, and performs wonderfully. Overall, it’s a great base-model digital thermostat. Searching for a Wi-Fi touchscreen thermostat to make your home smarter? Look no further down the Sensi Touch Wi-Fi Thermostat. This unit has a sleek modern design and a host of convenient features, and it's on the more affordable side, as smart thermostats go. The Sensi thermostat has a high-definition color touchscreen display that shows you the temperature, and it features adjustable backlighting and intuitive menus. The unit can be connected to your Wi-Fi and controlled remotely, and it integrates with other smart home devices like Amazon Alexa, Apple HomeKit, and more. It even boasts advanced features like geofencing for location-based temperature control, flexible scheduling and smart alerts. This touchscreen thermostat is designed for DIY installation, and reviewers agree the process is straightforward, as you use the app to walk you through it. Many say that the thermostat is very sleek and attractive, and they love that it is so easy to program and control from your phone. Are your electricity bills sky high? Then you could probably benefit from a thermostat that's specifically designed to help you save energy. The Nest Thermostat E Smart Wi-FI Programmable Thermostat is a newer model of the top-rated brand, and it has several unique features proven to help save energy and reduce your monthly bill. This smart thermostat has a unique frosted display that's designed to blend in with your home, no matter your style. The product learns your habits the more you use it, then it will automatically turn itself down after you leave the house so you don't waste energy on heating or cooling. Plus, you can program it to follow a basic schedule, and through the associated app, you can even check how much energy you're using every day. According to the manufacturer, using this smart thermostat saves customers an average of 10 to 12% on heating bills and up to 15% on cooling bills. Reviewers say it's a fantastic device that's easy to install, and many note it is truly a smart thermostat, learning your habits quickly and effectively adjusting the temperature to save you energy.